I don't know what's worse, a little girl falling down a rabbit hole, talking to plants and animals before being kidnapped by a psychopath. Or a young woman having the same adventure and not remembering that she had one as a child. 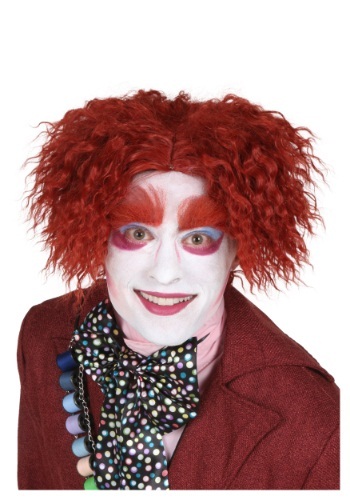 Either way on your next trip down the hole, the Adult Alice in Wonderland Wig will ensure that your hair looks fabulous. 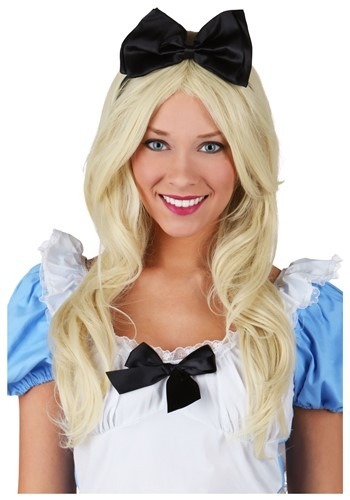 Before your trip down the rabbit hole, be adventure ready with this Adult Blonde Alice Wig! You're going to spend enough time having a psychedelic adventure, why worry about what's on your head? 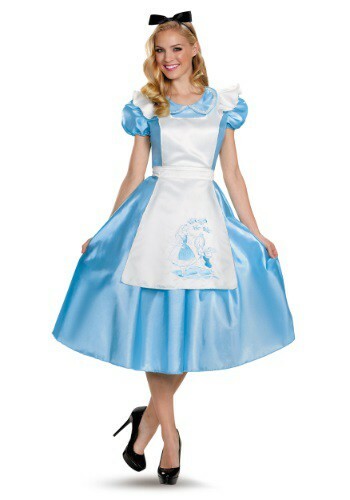 This Adult Delightful Alice Costume is a look fit for Wonderland. Think of a famous cat. Are you thinking of Lil Bub? How about Nyan Cat? Wait, are you imagining Grumpy Cat!? In our opinion, the Cheshire Cat is the coolest cat around. He has purple and pink stripes plus he possesses magical powers that make him float. All those other cats just aren't 'the cat's meow.' You are! 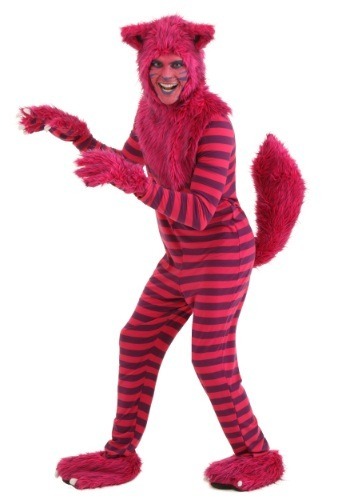 Remind people that Cheshire has been and always will be the best cat by wearing this Adult Deluxe Cheshire Cat Costume! The table is set with your favorite cups and saucers. You've brewed your favorite brand of loose leaf Darjeeling tea for exactly the perfect amount of time. The lemon wedges and sugar cubes have been artfully arranged. So what have you forgotten? To do your hair! No worries, you have this deluxe tea party wig to rescue you from the brink of a style disaster. Slip it on over your own unkempt locks and you'll be greeting guests to the most wonderful tea party they've ever encountered. 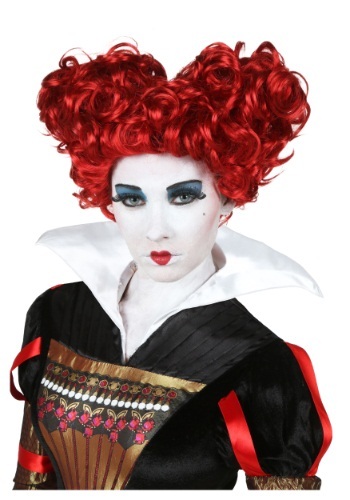 Make your wish their command in this deluxe red queen wig. The curly red tresses will give you the look of royalty and ensure that you don't have a hair out of place when you shout, "Off with their heads!" The story 'Alice in Wonderland' is kind of trippy. She falls down a rabbit hole into a whole new world. When does that ever happen. This Adult Psychedelic Alice Costume reflects the bizarre, but beloved story. Just pick up the short black gloves and black and white tights and you have a complete costume. Some redheads have a fiery personality. Other ones have a cataclysmic personality. It's probably because of the Red Queen's over-sized had and overabundance of red hair that led her to the tempestuous mood swings she suffers from. If you're looking for a big adventure, you can't go wrong with a trip to Wonderland. They got all kinds of interesting people, places, and things to do. Want to attend a tea party? No problem. Game of croquet? Easy! Want to meet a caterpillar the size of your car? Psh, give us a tough one! But if you're on your way there, you should really look the part, and you can do just that with our Adult Supreme Alice Costume. You'll look straight out of the Tenniel travel brochures and we just know that you're going to have an incredible time in Wonderland. There's no telling what you're going to run into once you make you're way through Wonderland! Crazy tea parties with the Mad Hatter, executions (maybe even your own) at the Queen of Hearts' palace or even a chance encounter with a hookah smoking caterpillar are all kind of the norm. When your new friends are as lively as that, you better look your best! Which means wearing a black bow in your hair. Why, you ask? That's the best part about Wonderland! Not much else makes sense there, so why start now? If you've eaten the cake that makes you bigger and outgrown your clothes, get one of the memorable looks from Tim Burton's Alice in this licensed Alice Red Court Dress! Perfect for rescuing the Bandersnatch and slaying the Jabberwocky. Although we haven't yet perfected the shrinking potion you need to find your way Wonderland, we have perfected a wig that gives you the hairstyle of Alice... with a bit of a twist. It's blonde, but it has hints of blue in it. We've heard that the Mad Hatter likes this look way better than plain blonde. 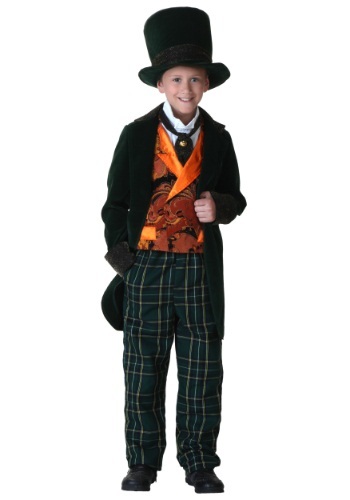 Your son will love this Boys Electric Mad Hatter Costume! complete it with white gloves, boots or boot tops, a wig, hat, and makeup for a totally loopy look.He'll be ready to host a Mad Tea Party! Not everyone wants to be Alice. Transform into your favorite devious kitty with this Cheshire Cat Ears and Tail. It's the easiest way to confuse the perky little Alice. Who,lets admit, can be confused quite easily. Alice is pretty cool but the Cheshire Cat is the real star of the show. He possesses some pretty sweet magical powers like disappearing at will and contorting his body. This Cheshire Cat Juniors Tank Dress isn't magical, but it will make people notice your impeccable fashion sense. You can wear this dress with a furry character hat to a costume party or just wear it with a jean jacket while you're out with friends. 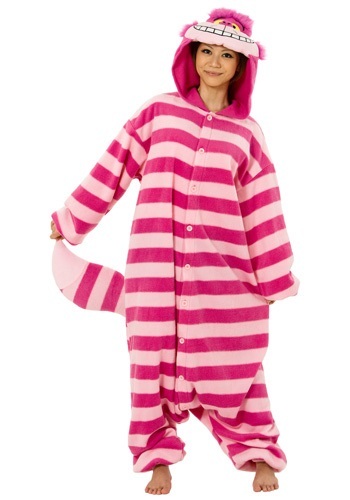 Wiping that grin off your face will be kind of hard while wearing these Cheshire Cat pajamas. Not only because you'll feel cozy and warm, but because our tests show that most people just feel like grinning when wearing the outfit of a riddle telling Wonderland cat who loves to make trouble for Alice. Also, the hood is always grinning, so it it's also impossible to not grin. Constantly grinning from ear to ear hurts your face. We know because we asked the Cheshire Cat ourselves. Well there's good news for you. 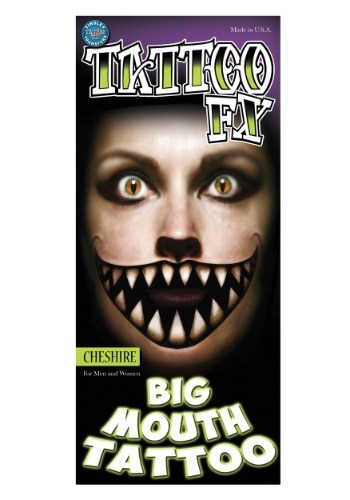 You can wear this Cheshire Cat Temporary Big Mouth Tattoo so you have the big smile but your face won't be sore afterward. That's even cooler than taking a trip to Wonderland! Try to avoid all rabbit holes! 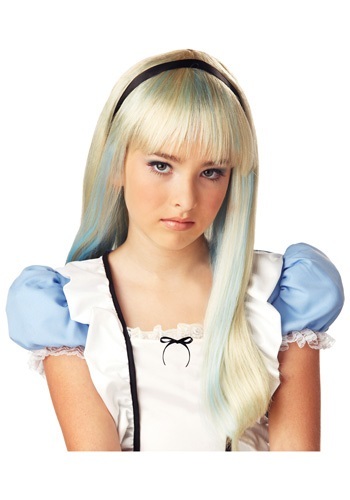 This Child Alice Costume is a fun storybook inspired costume for Halloween. Team up with the Mad Hatter and defeat the Red Queen once and for all! See that she doesn't go falling down holes once she's in this Child Alice Wig.If she does don't worry, we're almost sure she'll come back. Almost sure, who knows what really happens in Wonderland? If your daughter's anything like I was as a kid, she's not going to sit around and let you fix her hair. 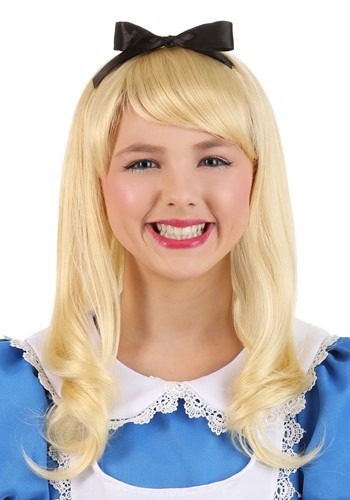 Take the hassle out of de-tangling with this Child Blonde Alice Wig. Plus, no one will even see how tangled her real hair is underneath! 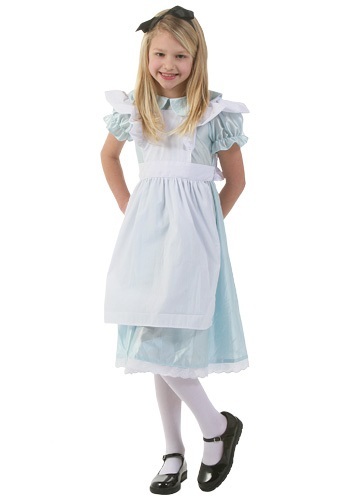 Enter the world of Wonderland this Halloween wearing this Child Deluxe Alice costume. Create a world of your own, where everything is nonsense! Nothing would be what it is because everything would be what it isn't. And contrary-wise; what it is it wouldn't be, and what it wouldn't be, it would. You see? Wish that you could disappear at will? Us too! It 'd be cool to be sitting on a branch one minute and then suddenly be floating in mid-air. It would also be really sweet to have luscious pink and purple fur. We haven't figured out the secret formula to make someone disappear yet, but we can give you some sweet pink and purple fur. 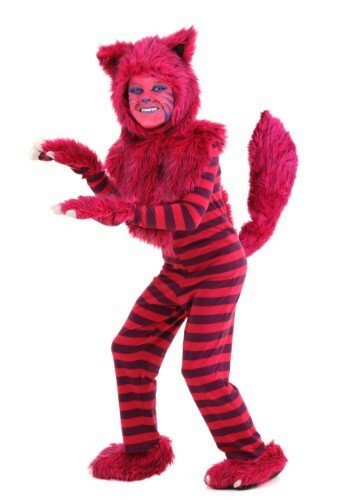 You'll be so happy when your wearing this deluxe costume that you'll have a permanent smile on your face just like the real Cheshire Cat. Give your child a chance to go a little mad this Halloween. When your tiny tot wears this adorable Mad Hatter costume he'll feel like he's just stepped into Wonderland. He'll be ready to have the craziest of all tea parties this holiday when he wears this outfit. The best thing about being queen of Wonderland is that anything wonderful can happen. You can play coquette with rabbits and cats, have a royal set of cards as your guards, and even drink tea with the Mad Hatter. 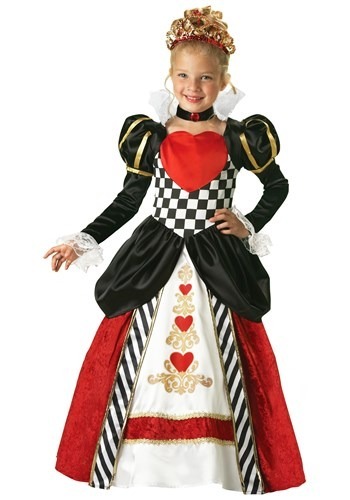 Lets just hope that you'll rule a little bit nicer than your processor in this Child Deluxe Queen of Hearts Costume. But, even if you don't, who can blame you in that beautiful gown! In Lewis Carroll's books, Alice isn't a princess, she's just an ordinary girl. But in Through the Looking Glass she eventually progresses across the chess board to become a queen. So it's still OK for her to wear a dress like this Princess Alice Costume. Great for a costume event or for everyday dress-up play. The Queen of Hearts wasn't always a queen. She started out as a princess. 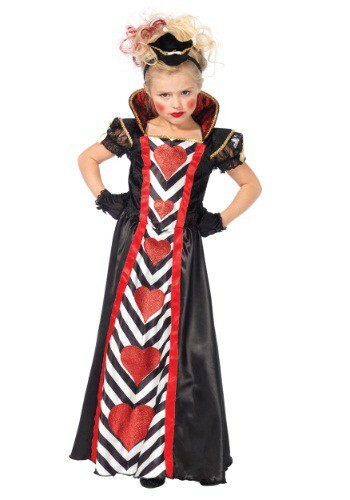 So she wore this Child Princess Queen of Hearts Costume in her girlhood. It takes time to learn how to be evil! It's time for tea! Hurry, you can't be late for this very important date. You'll need the perfect outfit. You'll look whimsical when you sit down with the Mad Hatter, the Hare, and the rest of the zany bunch. 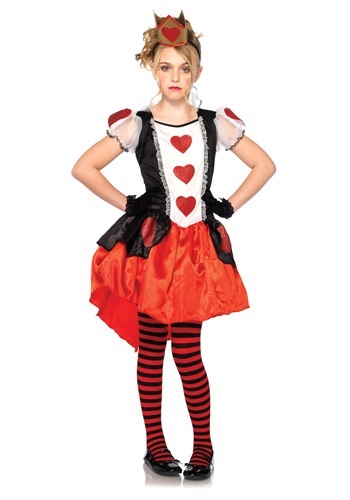 Just wear this Child Supreme Alice Costume and you'll fit right in. You'll look wonderful in Wonderland when you wear this cute costume. All of your new and nutty friends will definitely approve! When she wears this Child Wonderland Queen Costume, she can have fun separating people from their heads! Finish it with solid black, solid red, or striped tights and black or red shoes, and add a pair of gloves and a Queen of Hearts scepter for the full look. Take a page from the Hatter, insane is only amusing when tea is involved. Give me a hot cup of tea with cream and sugar and I'll tolerate anything. 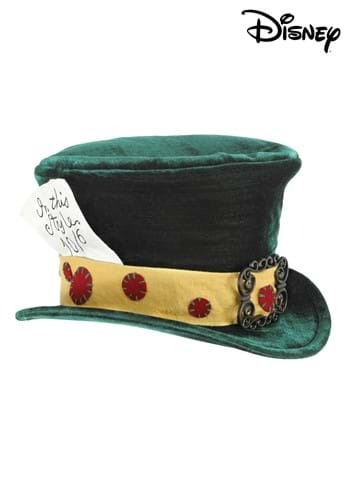 See if you can tolerate your little one tolerates once he's in this Child's Mad Hatter Hat. You won't be late for an important date when you wear this Classic Alice Deluxe Adult Costume--it has an image of the White Rabbit with his pocket watch printed on the apron! You will be a welcome guest at any tea party, mad or not. Or you'll be ready for a royal croquet game. Perhaps even slay the Jabberwock! 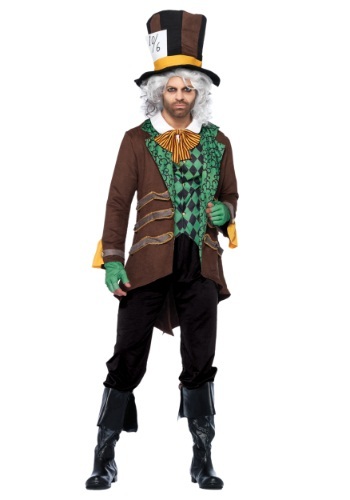 They say your costume should be the opposite of your personality, so if you're normally a straight laced, cool under pressure, kind of shy, wallflower type, then we think you ought to give this Mad Hatter costume a try. Wouldn't it be fun to go mad for at least one short night out of the entire year? That's what Halloween is all about! Just don't do anything you might regret... like that one time we went to a late night tea party in college and we had WAY too much Earl Grey, and man, things got crazy. Never found out how the Dormouse got stuck on the roof... he wouldn't talk to us after that. 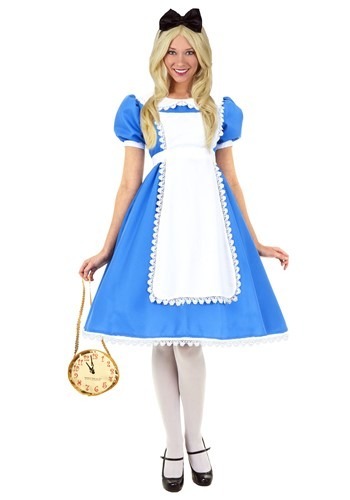 Experience the delights of Wonderland in this Delightful Alice Costume! It's sweet and sassy, and perfect to wear for a tea party, a caucus race, or a croquet match. Just be sure you don't offend the Queen of Hearts! NOTE: petticoat, purse & stockings shown in photo are sold separately. Who wouldn't want to have tea with this loony guy? 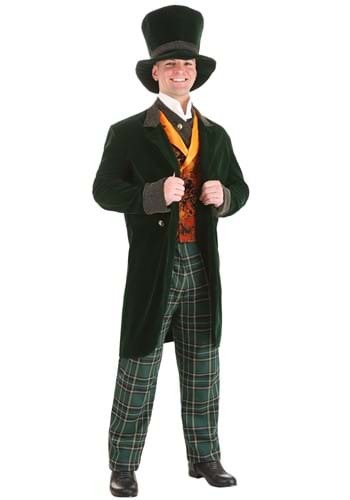 This Deluxe Adult Mad Hatter Costume will turn you into the famous storybook character from Wizard of Oz or Wonderland. 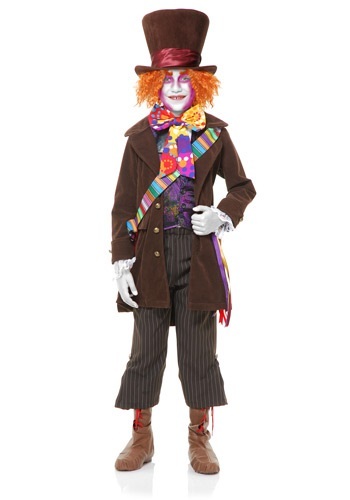 Pair this costume with an Alice in Wonderland or Wizard of Oz group costume. For a romantic and delightfully old-fashioned way to complete your Hatter look, this Deluxe Mad Hatter Hat Pin Set has all the charm you need. You simply pin it though the back band or lower crown of the hat and voila! These hat pins make a great collector's item as well. Are thinking about an un-birthday party perhaps? It's a delightful event with all sorts of tea, un-teas and other delicious delights. 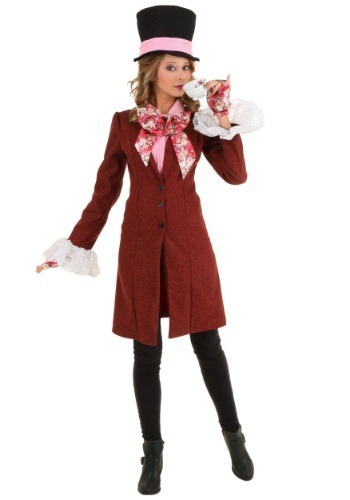 Of course, you'll need this Deluxe Mad Hatter Women's Costume, you will! It has a style tailor-made from Alice in Wonderland, so it's quite possibly the best way to look while celebrating an un-birthday party. The only thing you need to brim is your whimsical wit and delightfully mad personality. 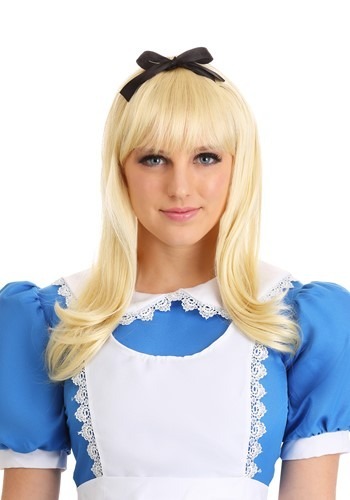 Get the latest in English Sunday fashion with a Deluxe Plus Size Alice Costume! Everything you want for a lovely day out in the park for a bit of tea and crackers is right here, including a white apron for any spills. So plan a picnic, and if you see a white rabbit run by, whatever you do, don't follow him! Just drink your tea. Are you missing that special outfit to wear to the tea party? The March Hare and Cheshire Cat, despite being delightfully mad, are pretty harsh when it comes to style. Wear the wrong outfit and they'll never let you hear the end of it! 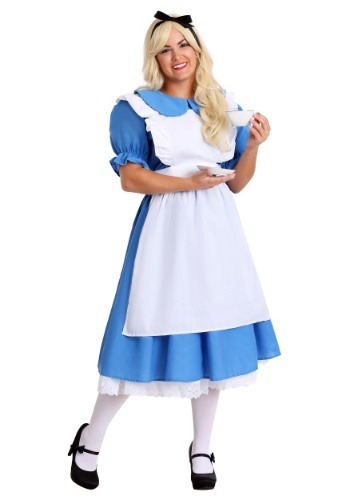 The good news is that this Deluxe Plus Size Womens Mad Hatter Costume has the classic look you need for any Alice in Wonderland party. We tested it out at our last tea party and The March Hare and Cheshire Cat were both speechless. Start your teen out on the right career path. No, not a doctor or lawyer... he's going to be a hatter! 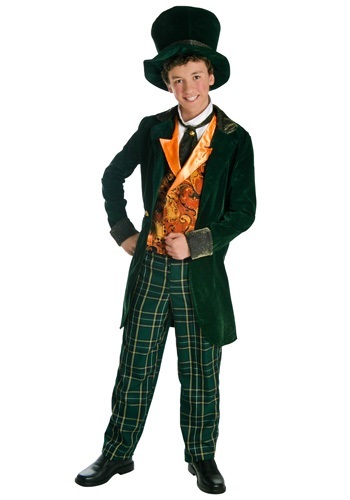 This Deluxe Teen Mad Hatter Costume is a good way to show them what they're in for if they decided to make hats for a living. Honestly, it looks pretty good! Hats, happiness, and all the tea you can drink! Who is ready for a tea party? Alice is! Did you invite the Mad Hatter? 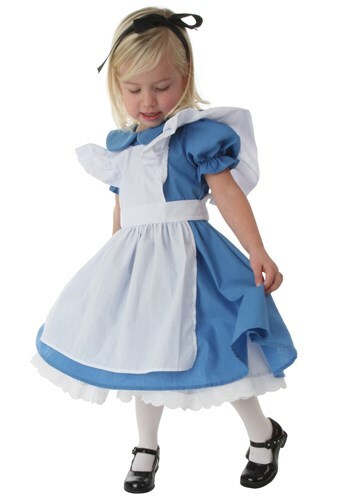 This Deluxe Toddler Alice Costume is an adorable storybook costume for young girls. They will love the puffy sleeves and ruffles! Just pick up the black shoes and the white tights for the complete look. Do you like tea parties? We're not talking normal tea-time kind of parties. We're talking about a party where your main guests are the March Hare, who has more than a few screws loose, and the Cheshire Cat, who regularly disappears into thin air. If that's the kind of tea party, then you're going to need an outfit to match. This Deluxe Women's Mad Hatter Costume brings you the look that will please every character in a trip to Wonderland. You'll look like a queen in a pair of unique thigh highs! These diamond Card Suit Thigh Highs are so stylish the Red Queen will be anxious to take your head. Tell her to get her own pair…these are for you. Complete you White Rabbit costume with this cozy hat and attached mittens. It can get chilly down the rabbit hole! She's gone mad! Well no, She's just gone fashionably whimsical with this Girl's Hatter Madness Costume! It's got all the fun patterns and mis-matching looks that you'd expect from Wonderland, and it even includes a little hat and price tag to top the whole thing off. Now all she needs is an unbirthday party to celebrate and a little Darjeeling and she'll be ready to go! Can you believe that Wonderland's Queen of Hearts was once a young girl? Of course she was. 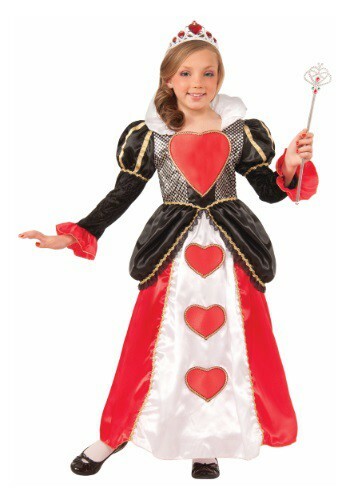 And she probably wore something like this Girls Queen of Hearts Costume while learning to shout, "OFF with their heads!" Does you little girl have a bit of a temper? Does she things to be the color red so much that she insists on painting absurd things, such as flowers, to have them be the correct color? Is she fond of croquet? If you answered yes to more than one of those questions, then we highly recommend this Girls Sweetheart Queen Costume for her. She has all of the characteristics of storybook royalty, so it's high time she dressed the part! So, you think you have what it takes to rule Wonderland? You're going to need to be tough, merciless, and just downright mean. Do you think you can do that? If not, we suggest just pretending! 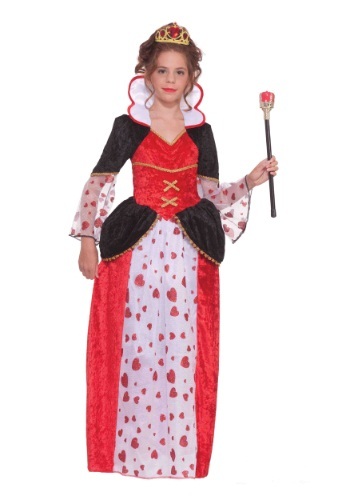 You can decide how you want to rule Wonderland when you wear this Girls Wonderland Queen Costume. If you chose to befriend Alice and\trick or treat with her, then we fully support that as well! You'll be a romantic beauty in this Heart Necklace. Wear it with a costume or incorporate it into your casual wardrobe. 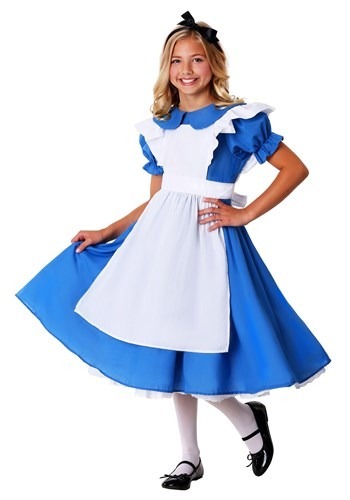 If a new Alice in Wonderland animated feature film were made, Alice just might be shown wearing something like this Hipster Alice Tween Costume! It's perfect for a mad tea party or an afternoon of croquet. So study up on your riddles, and practice your croquet!